Folding of steel structures is the future of sky scraper architecture, as seen from the Hanking Center Tower in Shenzhen, China, by Morphosis Architects. The 73-storey tower utilizes folded angles to carve out its niche in tower design, a departure from conventional towers which follow a general orthogonal podium and tower trend. As one approaches the tower’s podium, a grand plaza and dimensional hardscape give the building a public presence and enhances activities at the street level. Afterall, it is placed in a place of prominence on Shennan Boulevard and its core commercial objective is to attract the public purchasing power. For a podium anchored on high-end retail and dining, it presents an attractive front intriguing to the public eye. The idea of scale and proportion is exaggerated at a grandiose scale with a massive naturally lit atrium that occupies the building’s core. Glazed lobbies and sky gardens at every fifth floor create a communal hub for use by all tenants. The tower elegantly merges public components in the podium with private commercial space in the tower using folds that control physical and visual access. The form of the structure is unmistakably deconstructivist, defined by its steel structural system. It has shifting cores which open the main body of the tower, significantly minimizing the building’s structural footprint while maximizing open space. Its offset circulation cores are linked by sky bridges and diagonal mega-braces to the main tower. Offsetting the core also allows for a public to private gradient of activity on each floor plate, as tenants move from circulation and social spaces around the core to quieter perimeter offices with panoramic views. Freed from the interior of the building, circulation and amenity areas gain natural light and exterior views over the city to transform from conventional to vibrant public space. 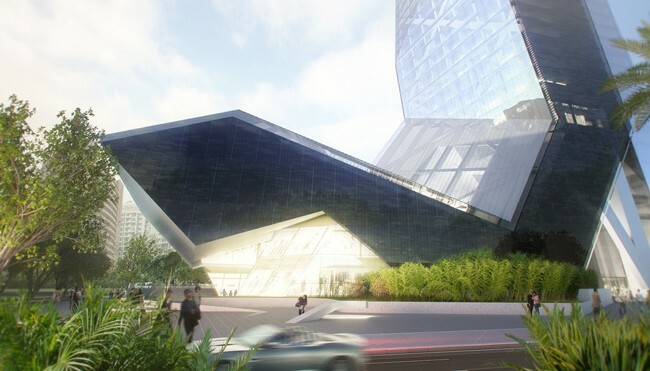 The tower’s approach to circulation, social, and work spaces is unique, giving a new perspective in tower design. It serves Shenzhen’s growing body of global professionals whose space demand requirements require dynamism and spontaneity. Designed as an incubator for emerging technologies, it provides growing firms with evolving space requirements, befitting the modern user. Expanding on the tradition of Skidmore, Owings & Merrill’s 1958 Inland Steel Building in Chicago, the tower’s division revives a classic way to define the form, from the outside in, while creating nearly open floor plates for flexible use. The open, uninterrupted floor plate, made possible by the tower’s offset core, dramatically increases space-planning flexibility and offers healthier work environments with enhanced natural light and airflow. From the angle of deconstructivism, its separate disjointed volumes add to its spontaneous character, which might as well be critiqued as irrational. The proportion and balance between form exploration and actual lettable space is still a debate for non-conformist forms. The feeling of inferiority that some of these images ellicit on the observer is precisely what Frank Lloyd Wright disliked about the scale of buildings on cities like New York – he said man was disrespected. The awe produced by towers such as these in people come from a feeling of inferiority, belittling the user. However, the public seems to enjoy such extravagance, especially when it comes to architecture, the grander, the better. As Daniel Anthony Fraga puts it, this piece of architecture is unapolageticly capitalist and it serves big business and corporate culture – and it shows, in a brutally honest way. Floor after floor, Architecture is surrendered to the demands of the contemporary world. It’s a symptom of globalization; a palace for both progress and it’s inherent decay. And a beautiful one, at that.